Sparkling wine is without a doubt the most fun wine to drink, but it’s no simple trick getting those bubbles to appear! It takes a whole lot of skill to get it just right. When it comes to sparking, it’s all about patience. There are several winemaking methods used to produce sparkling wine. The winemaking practices aimed at obtaining carbonation can be broken into two big groups: bottle fermented and tank fermented. What these two methods have in common is the use of a sealed container to trap carbon dioxide and produce carbonation in the finished wine. The base wine (aka wine pre-bubbles) has a relatively low alcohol content—around 10%—and a pronounced acidic structure. These characteristics are acquired by picking the grapes before the sugar accumulation and phenolic maturity (see Winemaking Dictionary) is fully completed. The juice obtained from this fruit will have lower sugar levels and higher acidity, therefore producing a less alcoholic wine, which is important, as the wine will undergo a second fermentation that will increase the overall alcohol content. In some cases the base wines are called cuvée and can contain wines from multiple vintages. Sparkling wines made using the traditional method, like our Blanc de Blancs, undergo secondary fermentation in the bottle, which creates bubbles. Upon completion of the primary alcoholic fermentation, yeast and sugar (referred to as the tirage) are added to the base wine. It is then transferred to bottle and sealed with a crown cap. This is where the bubbles are born. The goal of secondary fermentation in méthod champenoise is to capture the bubbles within the wine rather than letting the CO2 escape. The yeast eats the sugar—which produces alcohol, thus increasing the alcohol level of the wine from the initial 10% to 12-13%— leaving CO2 as the bi-product. The CO2, unable to escape from the sealed bottle, incorporates into the wine, resulting in the formation of the magical, delicate bubbles we all love! Once secondary fermentation is complete, the wine is left to age sur lie (aka on the lees) in the bottle, which imparts flavors and builds up the palate of the wine. The length of time spent aging depends on the wine that is being produced and the flavor the winemaker is seeking. For example, the minimum requirement for non-vintage Champagne (base wines containing multiple vintages) is 15 months on the lees. For a single vintage Champagne, it’s three years! Extended lees aging in-bottle adds depth and complexity to the wine. Once the wine has been sufficiently aged, the bottles begin going through the riddling process to remove the lees. The bottles are placed at an angle, neck down, and slowly turned over time, which moves the lees down to neck of the bottle towards the cap. Once the lees have settled in the cap, the necks of the bottle are put into a brine bath that freezes the lees into a solid mass. The crown cap is then removed and the solid mass is forced out by the pressure in the bottle. This removal of the yeast sediment is known as disgorgement. In the final step, a solution of wine and sugar—known as the dosage—is added to the bottles to compensate for the loss of volume after disgorgement. The dosage also adds more texture and rounds out the palate of the final product. Finally, after the dosage has been added the bottles are sealed with the classic cork cap and metal cage and are ready to be enjoyed! Another way of making bottle fermented sparkling wine is the ancestral method. Wines produced using this method are called Pétillant Naturel or Pet Nat for short. It is the oldest known method used to obtain carbonation and is done by bottling the fermenting must before it completes primary fermentation. The biggest challenge in this winemaking practice is the lack of control over secondary fermentation. The dosage is typically omitted for this method because the residual sugar present in the fermenting juice adds enough sweetness to round out the pallet. Since these wines do not typically undergo the riddling and disgorgement process—which removes most of sediment present in the bottle—it is common for these wines to be rustic and hazy in appearance. However, the wine can be filtered prior to bottling to minimize the amount of sediment in the bottle, if the winemaker chooses. 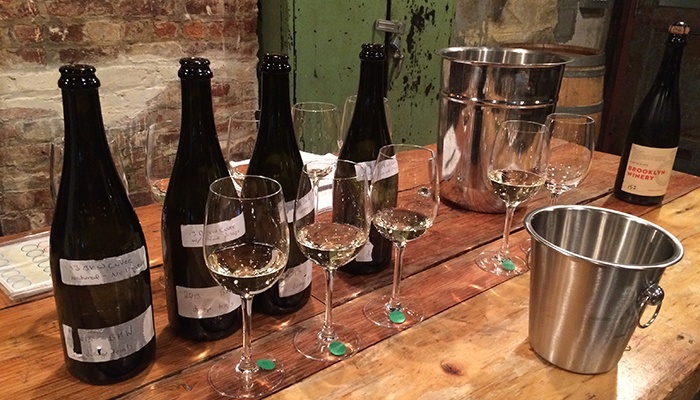 Though not as time consuming and labor intensive as other sparkling wine methods, wines produced using the ancestral method can be much more difficult to perfect. Since there are fewer stages during the production process at which to correct or control the finished product, it takes precise timing and skill on the part of the winemaker to get it just right. Charmat method is used most notably in the production of Prosecco. In this process, upon completion of alcoholic fermentation, the base wine and tirage (sugar and yeast needed for secondary fermentation) are transferred to a stainless steel tank built to sustain the inner pressure created by the release of CO2. Since the second alcoholic fermentation takes place in large tanks with less pressure than bottle aged sparkling, the bubbles produced are lighter and larger. The greater the pressure, the finer and more persistent the bubbles in the finished wine. When the second fermentation is complete, the sediment is removed and the wine is transferred to a second tank containing the dosage. The wine is then filtered and bottled. The charmat method allows winemakers to slightly abate the cost of sparkling wine production. Sparkling wine can only be referred to as “Champagne” if it was grown and produced in the Champagne region of France. 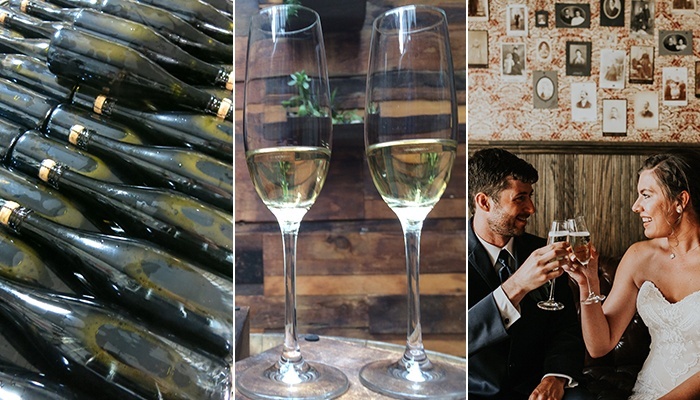 Sparkling wine takes a lot of love and care to get just right, making it the perfect wine to sip when celebrating. 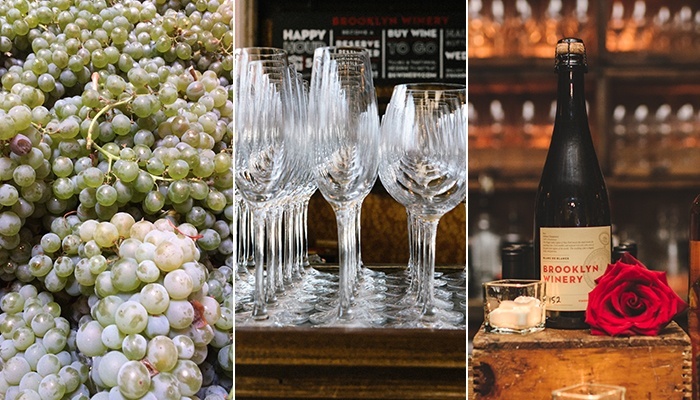 Brooklyn Winery’s Blanc de Blancs is one of our most special wines, and we hope you will give it a try!